What makes a project easy to close? VALUE that is so juicy and enticing that the prospect is salivating over it. What makes it easy to command higher fees? Perceived VALUE that is off the charts. Nice in theory, but how do you demonstrate the value of your project? It’s easy as strawberry-rhubarb pie. I’m literally going to show you how. 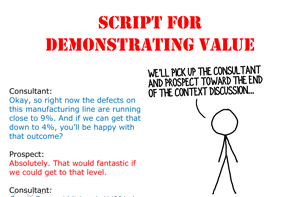 Below is a link to an infographic with the entire script—a sample conversation outlining exactly what to say to a client. Review the infographic, practice a few times and you’ll be winning bigger fees for more valuable projects in no time. Click Here to Get The Infographic! think this is too confusing in a meeting. maybe as a post meeting recap slide. but just getting the total project improvement value in $s is probably enough. You aligned your value at the $10 million why settle for $3 million further in the conversation. Plus emotionally people remember the first number you put in their head. I just had a similar conversation with a new prospect. Just aligned my value to the value of the improvement (read: the $10 million in your scenario) and won the business. The further discussion was described in the proposal. Buy when I asked for a % of the improvement – a.k.a. my fees – I had a much larger number to negotiate with. You raise a good point, Adam: the consultant has to be comfortable with this process (which takes some practice) to guide the client through it well. Fortunately, it’s a skill that most consultants do start to master after a handful of tries. Congratulations on winning the project! You quantified value with your client, which puts you heads and shoulders above many, many consultants. Many clients award projects without any agreement on value and most don’t work through the downward adjustments…with the consultant in the room. They’re definitely discounting your number though. My experience has been that the entire process, including the downward adjustments is much more effective than failing to talk about value or only sticking with the highest valuation possible. These steps, along with the risks/concerns part of the Context Discussion are a major reason why I win so many projects at such a high fee premium. Thanks for posting! Great piece today. We are working on installing an opportunity planning process across our sales team. Compelling Events and Unique Business Value are two core things we are pushing on to grow sales. This piece gets at both of those. Thanks, Ed. Can you explain for the other consultants who are reading what you mean by Compelling Events? Also, good for you (and the Nolan Company) for putting the process in place–that is a key step on the path to growing a boutique firm to the next stage or success. Please post again with you successes and learning as you roll the process out. David, nicely put as always. This infographic made me realize the perils of being too detailed in calculating the risk adjusted value. It is better to avoid too much detail, and keep this at a high level as your example shows. One of my clients has got bogged down in the detail of the RAV estimate, and it is taking a time to get the numbers. If I had kept this at a higher level, things might have gone a lot faster. That’s a great takeaway, Chris. While some clients don’t want to go into the process at all, others will happily drag you down rabbit holes. The entire Context Discussion is an exercise in guiding the prospect to find that middle ground. Thanks for posting! David you did a wonderful job again!! The information sums up the creation of value and the process of building it. Thank you, Chevine. Let me know about your successes with your prospects.